I like Bickford of Greenwood. I was impressed from the moment I stepped in the door. It felt comfortable right from the beginning. My mother has been there now for about six weeks. She is not involved in a lot of activities at this time, but they do have light physical fitness activity during the day. It is a small community, but the CNAs and the nursing staff are all very nice. They treat Mom as a member of the family. My mom likes the food, which is all made right there. The price is average. The best way to get to know a community is by scheduling a tour. 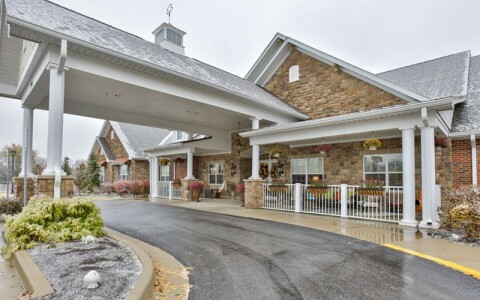 See the facilities, meet the staff and residents, and get a feel first hand what it's like to live at Bickford of Greenwood Assisted Living. Offering a permanent, welcoming home for seniors in need of supported retirement living, Bickford of Greenwood treats every resident under our care with the same dignity and respect we do our own family members. Our brand-new community is centrally located just 12 miles south of Indianapolis, close to shopping centers, parks and medical facilities. Bickford of Greenwood is proud to be a branch on the Bickford Senior Living family tree. At Bickford, our operating philosophy is simply: enrich the happiness in the lives of our residents and create a workplace where our employees are recognized for providing exemplary care. With communities in nine states throughout the Midwest, we pride ourselves on being trusted by families to care for their loved ones. Our apartment homes feature convenient kitchenettes, private bathrooms, individual climate control, and ergonomic, senior-friendly fixtures. Apartments may be lived in privately or shared by roommates, and pets are also welcome to join their owners in their homes. To fulfill our mission of enhancing happiness, we offer a variety of daily activities that engage the body, mind and soul. From dementia support groups and regular church services to happy hours and dance parties, there is always something fun happening at Bickford of Greenwood. We also encourage seniors to share their unique talents through our “Bickford Angels” volunteer program. For the comfort and convenience of our residents, we take care of the housekeeping, linen changing, snow removal, facility maintenance, landscaping, daily meal service and transportation to and from medical appointments and group excursions. We are also able to provide laundry services and pet care upon request. Our certified caregivers are on- site 24/7 to assist seniors with life's daily activities, such as dressing, bathing, transferring and managing their medications. A full-time Registered Nurse oversees all care plans, monitors changes in health and helps coordinate any outside medical services. At Bickford of Greenwood, we feel our community is an extension of our residents' home and that we are simply their guests.